Shirodhara, an effective de-stress treatment in Ayurvedic system, deeply relaxes the nervous system, lowers metabolism, integrates brain function and creates brain wave coherence and an alpha state. The cerebral circulation is compromised when the brain is under stress .With Shirodhara treatment, as oil is poured on the forehead, the nervous system is deeply stilled. The brain waves will slow down and become coherent. 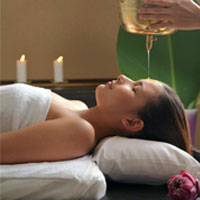 The outcome of Shirodhara therapy : better brain function, mood stability and improved stress handling ability. With each successive such treatment, the mind systematically achieves an even deeper state of silence and more healing takes place. The benefit of regular Shirodhara treatments are said to be the increase in blood circulation to the brain, improved memory, nourished the hair and scalp, and encourage sound sleep and calm body and mind.